Holmes Miller is delighted to be supporting Paul O'Gorman Leukaemia Research Centre in Glasgow (via the University of Glasgow Trust) as our selected Charity in 2017. 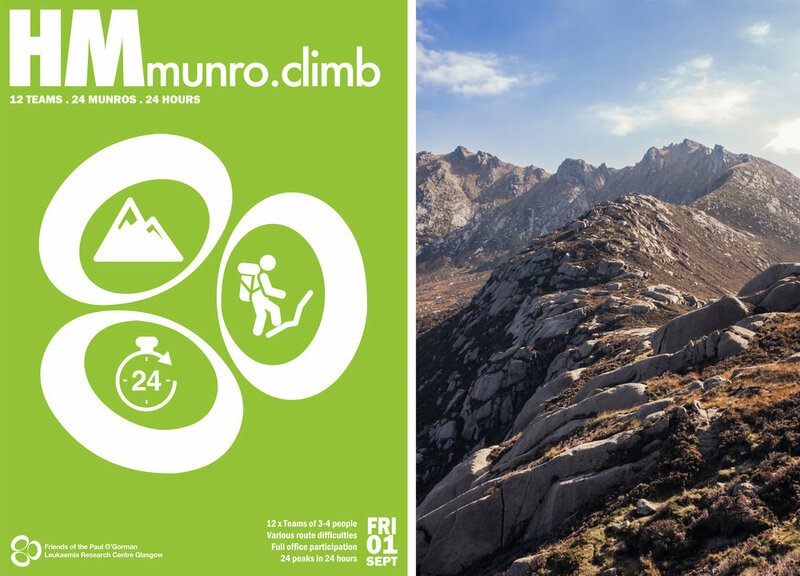 In support of the charity our entire office will be pulling on their walking boots, crampons and waterproof jackets as we head out in to the Scottish Mountains on Friday 1st September and seek to bag ‘24 Munros in 24 Hours’. To make the blisters and weary legs worthwhile we would be very grateful for your support, encouragement and any charitable donations that you can offer. Donations, large or small, can be made via the attached link. JustGiving sends your donation straight to University Of Glasgow Trust and automatically reclaims Gift Aid if you are a UK taxpayer, so your donation is worth even more. See the attached link to learn more about the excellent work undertaken by the Paul O'Gorman Leukaemia Research Centre in Glasgow.